Soon after learning I was less than nine months away from becoming a first-time father, I experienced an unexpected sense of déjà vu. The baby was coming whether or not the room was painted or anything else was ready. That feeling of being hitched to a biological clock that stops for no one is a feeling I feel every winter around this time. The days are getting noticeably longer, my garden stares me down from its bed, and I realize I had better order seeds. If you have a garden, it's probably staring you down, too, and you would be advised to pay it a little mind. Because when spring arrives, like that baby, you'll want to be prepared. It may seem obsessive to fret about one's garden in winter. Indeed, it is obsessive. But obsession has its benefits. Suppose, for example, that you wish to grow shallots by starting them indoors, because that is undeniably the best way to do it. Shallot seeds should be started by the end of March, at the latest. Unless you can find shallot seeds at your local store -- and good luck with that -- you have to order those seeds from a seed company. And even if you order your shallots from Johnny's, which has the fastest turnaround in the business, the window is closing. For some reason, most people plant little shallot bulbs, called sets, instead of growing them from seed. Each little bulb grows into a cluster of bulbs, kind of like garlic. But this happens to be a horribly inefficient way of growing shallots. Browsing online, I see I can get 10 sets, or bulbs, for $10.95. These will yield about 80 to 100 small shallots. Or, I can buy a packet of 250 seeds for $5. Shallots planted from seed can grow much larger than those that come from sets, especially if you follow my special technique. Scatter the seeds in an open tray of potting soil, and keep them wet as they germinate and grow, in the greenhouse or by the window. When the shoots are about four inches tall, the tray will resemble a lawn in need of a mow, so use scissors to give it a haircut down to two inches. This will make the shoots increase their girth, which will result in bigger shallot bulbs. Transplant them into the garden after the frost is done, at least six inches apart. Tomatoes, peppers and eggplant can also be started ASAP, as can kale and other hearty greens that should be transplanted to the garden as soon as the ground can be worked. These days, however, I mostly purchase plant starts from a farmers’ market, and it's a beautiful thing. My sabbatical from starting plants indoors brings relief this time each winter. The garden is still coming, but it isn't bearing down on me like a tailgater. Hoar frost on collard leaves. 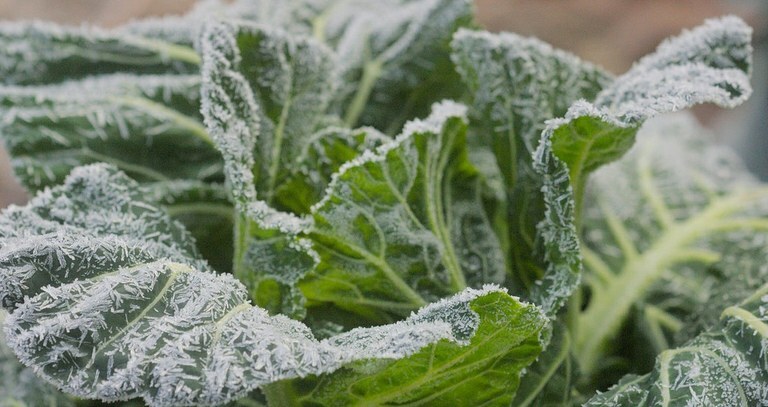 Collard grows just fine in cold conditions. Chicory plants are so hardy you can basically throw the seeds on the melting snow, and something will happen. I like to plant chicory in the garlic patch, which will be harvested in July. After the garlic is gone, the chicory takes over. It will re-seed itself if you let it, and spread into an edible ground cover over the years. You can then pull it in spots, here and there, and plant other things, like the foods in your culinary arsenal that you want to be able to run out and grab, at a moment's notice. Obviously, everyone needs a tomato plant or two, and a couple of melons. And some peas and berries for the kids to pick. And some corn and sunflowers for the beans to climb. Add cucumbers, and that should do it. I’ll also leave a space reserved for plants that farmers will seduce me into buying in late May. And what the heck, I'll scatter some shallot seeds, too, straight into the ground along with those chicory seeds, which I really must order. 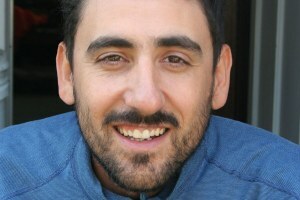 Ari LeVaux is a contributor to Writers on the Range, an opinion service of High Country News. He writes about food in Missoula, Montana.